This holiday, find cool bedroom gadgets that can help wake up or mellow out your gift recipient. There’s more to decor than wall art and rugs. Think outside the box and look at Kickstarter projects or innovations from your favorite brands. Or consider what goes wrong during people’s morning or night routines. Sleep solutions, alarms and lights don’t have to be boring, but a fascinating way to play with the latest tech inventions. A solution to snoring that will put you and your partner to sleep- in a good way. Nora includes an inflatable pad and a listener. 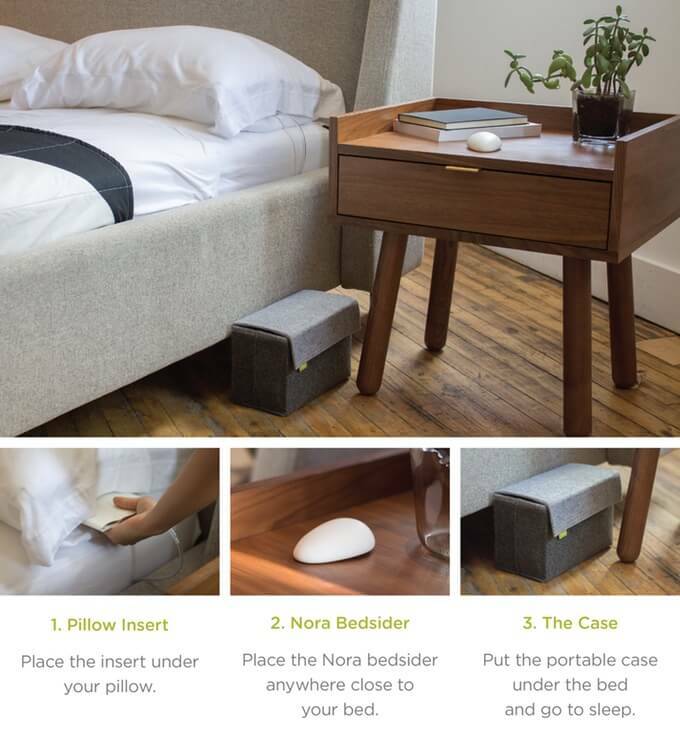 Once Nora detects snoring, it will gently inflate your favorite pillow (with the pad inserted beneath) to open and relax your muscles. This noninvasive sleep solution can be just as much as a gift to you as it is to your partner. It’s also extremely subtle, in its technology and its design. Set the mood of your room with Philips HUE. These smart lightbulbs can change the color of your room with a mobile app. With cool APIs, HUE can match the mood of your music or even replicate coloring from your favorite photo. While HUE can be colorful, it can also be practical. From your Smartphone or tablet, help achieve different lighting options for different functions, such as reading light or calming light. Enjoy playing with the lighting in your bedroom, or anywhere else at home. Love white noise? Travel often? Live next to noisy neighbors? Then pick the Snooz to get a better night’s sleep. The “fan” replicates the white noise sound without making the room cold or adding to the energy bill. Also, Snooz can be controlled manually or with a mobile app. Find serenity by draining out the rest of the world. No crickets or storm sounds here. Just the white noise you need to drift asleep. Wake up to beautiful lighting and your favorite song. This refreshing wake up call uses a blue light that has proven to decrease melatonin to let your body wake up gradually, similar to a sunrise experience. As for the music, hook up with your Spotify playlist or one of Aura’s. It’s a modern invention for a timeless object. Get your day started off right! Know someone that can’t part with their tablet? Help them search and stream online from the comfort of their bed. iBed can be used as a bedside table or even overhead. Yes, that means you won’t have to drop your tablet on your head anymore. It’s a pragmatic, but also goofy, present that could be right for the iPad-obsessed person in your life. This alarm clock is either from your dreams or your worst nightmare. The wheeled alarm sounds when you need to get up, and then hides so you have to get out of bed. Unlike phone alarms or stationary clock alarms, which are easy to snooze and forget about, Clocky is a fun way to get on your feet and ready for the day. Keep your room smelling nicer for longer with Stadler aroma diffuser. This diffuser, in a masculine black or a contemporary white- as well as a playful yellow, blue, multi or pink, uses ultrasonic technology to mix water with essential oil to create a mist to freshen the home. The mist emits every 20 minutes and can be programmed to run for different times. Best of all, if your gift recipient already has a favorite brand of essential oil, they can use it with this aroma diffuser. No need to limit yourself to one brand, like air fresheners, but experience a wide variety of home scents! And now you know what to get them for their birthday- more oils!